Wrigley View prides itself on making your Wrigley Rooftop experience one that you and your guest will be talking about well after the final pitch. Starting this year (2015) Wrigley View has partnered up with Buona Beef restaurant thus combining two of Chicago's favorite things, Baseball and Beefs! Wrigley View was recently renovated before the 2010 season. It is located down the third base line next to the fire house. The view from this venue is one of the only ones that allows for a clear line of sight into home plate as well as a full view of the historic scoreboard in the outfield. Wrigley View’s guests have access to all four of the unique vantage points; Wrigley View Lounge which has 71 fixed stadium style seats, Stadium Club, Stadium Buffet, and the spectacular Sky Deck. 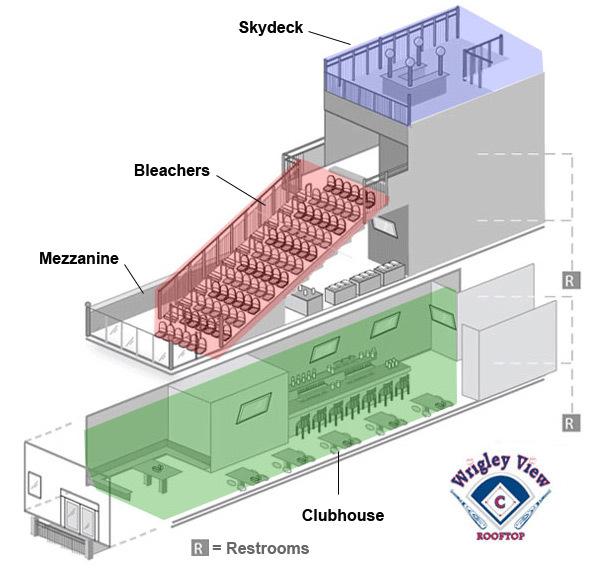 The Sky Deck provides a scenic 360 degree vantage point of Wrigley Field and the city. Soft Pretzels with yellow mustard and nacho cheese. Nacho Bar - Corn tortilla chips served with nacho cheese and jalapenos. Vegetable Crudite - Sticks of zucchini, jicama, red peppers, yellow peppers, carrots, and celery. Served with a creamy chipotle ranch dip. Mediterranean Potato Salad: green beans, red onions, and kalamata olives in a rosemary vinaigrette. Whole Wheat Pasta Salad: whole wheat pasta , tomatoes, cucumbers, black olives, red peppers, parmesan, balsamic vinaigrette. Individual bag of chips: ¼ oz. Miss Vicky’s chips with assorted Lay’s products. Angus Hamburgers & Cheeseburgers (6 oz. ): served on a freshly baked roll with lettuce, tomato, onions, pickles, ketchup, and mustard. Buona’s Italian Beef: served on a freshly baked roll with sweet green peppers and hot giardiniera peppers. Italian Sausage: Served on a freshly baked roll smothered in sweet bell peppers and hot giardiniera peppers. Jumbo Angus Hot dogs: 6/1 all beef hot dog, served on a gourmet bun, served with onions, relish, mustard, ketchup, and sport peppers. Grilled Chicken Sandwiches: served on a freshly baked roll with cheese, lettuce, tomato, onion, mayo and barbeque sauce. Gluten Free Black Bean Burger: black beans, corn, and brown rice. Gourmet Cookies & Brownies: Ghirardelli brownies served with chocolate chunk, oatmeal raisin, and sugar cookies. Reservations for an event is non-cancelable and fees are nonrefundable. If the game is cancelled before the doors open on game day, a full refund will be given. No refunds are given if the game is delayed due to inclement weather, food and beverages will continue to be served for a total of 3 hours.